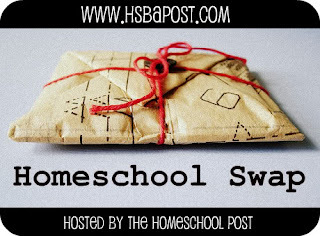 Grace Christian Homeschool: My Homeschool Swap! The door bell rang and there it was....just like Christmas - my homeschool swap! Thank you Traci!! The kids have already tried to swipe my bubble gum and lemon heads! I guess I'll share :) I can't wait to start reading the Above Rubies magazine. We must think alike because we both sent the same binder clips to each other!! You can never have too many of those! Again, thank you Traci and The Homeschool Post for setting this up! Another swap should be starting in September. I pray you all have a wonderful homeschooling year & enjoy you new adventures!